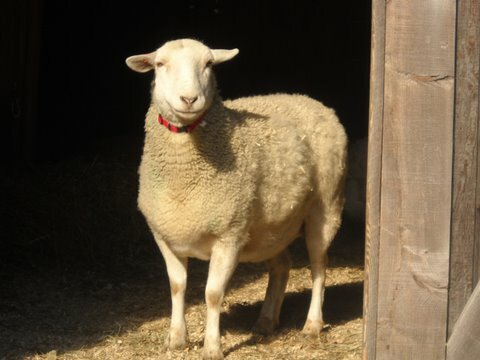 Missy, a beautiful 5-year old hair sheep, joined our Safe Haven family in January. She had been headed for slaughter because she was unable to produce live offspring for two consecutive years. Fortunately, her owner was happy to relinquish Missy to Safe Haven. Missy quickly bonded with our lovely Claria who had losther friend Maggie to cancer in the fall and was very lonely.Missy and Claria quickly became friends. They travel about the farm together, calling out to each other whenever they become separated. Missy is still very shy, since her sole contact with humans was as a commodity. She never received a gentle touch, a scratch behind her ears, or even a special treat. However, she is very inquisitive and quickly learned that at Safe Haven she gets carrots and molasses and oat bars after dinner and that humans only want her to be happy. 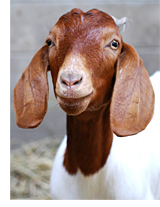 Missy is an ambassador for farm animals everywhere whose lives are ended when they no longer have any economic value. At Safe Haven, Missy is already making friends, and she will enjoy the peace and happiness she deserves. 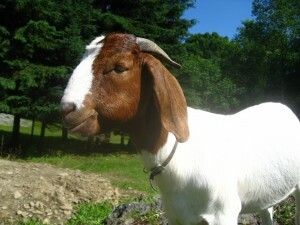 Isadora is a runaway Boer goat from one of the Borough’s live markets, places where animals are hand-selected by customers and slaughtered on site. She was found along with her friend and co-escapee, Duncan, seen at the intersection of the Hutchinson River Parkway and I-95 South. After spending her recovery time at Farm Sanctuary in Watkins Glen, NY, she and Duncan were transferred to Safe Haven just in time to be our first residents in our new barn! Duncan is a pygmy goat who was transferred to Safe Haven along with Isadora after their daring escapade from the jaws of death to freedom. Still a young fella, he is having a blast exploring the pastures and forests here at the sanctuary. He and Isadora are inseparable and cry loudly if they are apart for even a few seconds, showing the bond forged by their shared adventure. He’s a little guy with a big attitude! 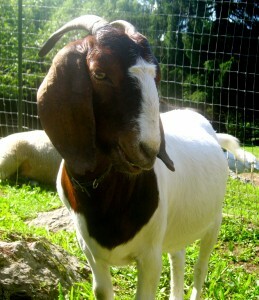 Boomer is a Boer (meat) goat born at Safe Haven Farm Sanctuary on July 9, 2008 to a beautiful and loving mother, Matilda. Matilda became pregnant while crowded into a live market in the Bronx from where she was rescued. She was loaded with parasites and had a serious viral infection and was very frightened of humans when she first arrived. With medication, frequent veterinarian visits, and great nutrition, Mattie, as we call her, got well, but her stomach continued to get bigger. Several vet visits couldn’t confirm her pregnancy, but on July 9 she delivered a beautiful baby boy. Boomer looks very much like his mom. He has long ears and a white streak up his face. Soon after being born, he got up and wobbled around his stall. It didn’t take him long to find his mother’s milk, and he soon was jumping and twisting and leaping around playfully. Boomer is a lucky boy; had his mom been slaughtered in the live market he would never have been born at all, or if he had been born in a feedlot or auction pen prior to being shipped to the live market, he would have been allowed to live only a few months. Unlike Mattie, Boomer has never known anything but loving human contact; he is not afraid like his mom was, and in fact he loves to play with humans, big and little. With Boomer’s birth, his mom has become trusting and loving too, seeing that humans can nurture and care for animals, especially her handsome son. 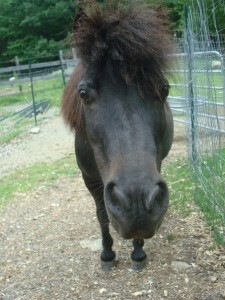 Cory is a black miniature horse. Miniature horses are found all over the world; they usually range from 34 to 38 inches tall at the withers and include several breeds. They are too small to be ridden and were often used to pull carts, most notably in the coal mines of Wales. Cory lived the first 17 years of her life with one family in New Hampshire. As the years went by, and the children grew, the family acquired several large horses, and Cory was ignored. She was too little to ride and the family had no cart for her to pull, so she had nothing to do. The big horses picked on her, and she ended up spending most of her time alone in a small dirt paddock. Horses are herd animals and very sociable, so Cory’s separation led to compulsive rubbing and overeating. She was sad and lonely. Her family heard about Safe Haven Farm Sanctuary, and when we heard her story, we welcomed her to join our family. When Cory climbed down the ramp from the station wagon, her ears pricked up and she whinnied and heard several friendly greetings from the sheep and goats in return. She eagerly trotted toward the barn to meet her new friends. All of her lonely habits have since disappeared, and she looks forward to petting, grooming, and relaxing in the pasture. 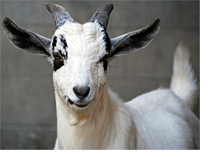 Matilda, a Boer goat, was rescued from a live meat market in the Bronx, where she had been kept in a crowded pen awaiting slaughter. She was very sick upon her arrival at the farm, infested with parasites, and had contracted a viral illness. We later found out that she had been impregnated while on the way to slaughter, so she would have been killed along with her unborn baby. Even after arriving safely at the farm, it took her awhile to trust people. She was checked and treated by the vet, and received, probably for the first time, gentle loving care and delicious, healthy food. She gradually lost her fear of humans, and started running and jumping in the pastures and nibbling cranberries and blueberries from human hands. Over time, it became apparent that Mattie was pregnant and she delivered a beautiful baby boy in July. Despite her youth, Mattie is a great mom, feeding and cleaning her handsome young baby and watching over him. Matilda has forgiven us humans and stands quietly while we pet her baby. 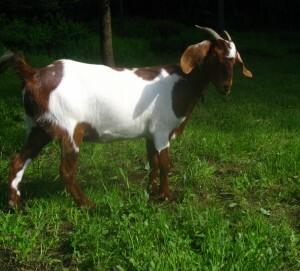 Basil is a Boer goat, a breed raised for meat. She was also rescued from a live meat market in the Bronx. She was very leery of human contact when she first arrived at the farm but now loves to play and jump on hay bales. She actually loves to be the clown in the group and do silly acrobatic stunts on any prop she can find. She loves fresh baby carrots and other treats, and you will often find her standing on her hind feet reaching into the branches of a tree to get the leaves. She is such a pro, that she has taught baby Boomer the same trick. 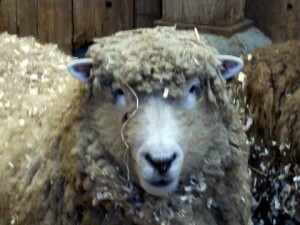 Sprinkles the sheep was found in a live market in the Bronx in a pen crowded with animals awaiting slaughter. Her ears were missing their tips, evidence of frostbite from having been kept outside in a bitter winter cold. She also had many parasites and a bad cough, and made no natural sheep sounds. Since coming to Safe Haven, Sprinkles has lost her parasites and her cough and now *Baaas* like a natural sheep. She also enjoys a good scratch behind her ears and going out in the sun with her pal, Angel. When you enter the barn, Sprinkles is often the first one to come up and say hi, showing us all that she has learned to trust again. When Angel came to the sanctuary from a live meat market she was timid and made no sounds. 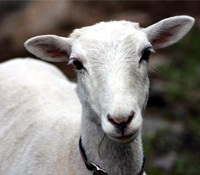 She is a lovely white lamb that had been destined to be killed and served at the dinner table. It took several weeks of loving, gentle care before Angel would allow herself to be touched. Now, she runs around the pasture with her good friends Sprinkles the sheep and the other animals. Although the most timid of the crew, she loves to eat cranberries and carrots, and shuts her eyes and wags her tail while she gets scratched behind her ears. She has learned to trust humans, and her willingness to forgive us for her past misery and pain should be a lesson to us all. 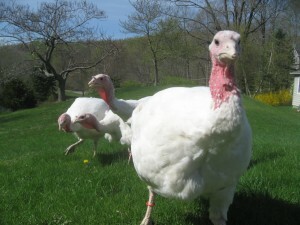 These beautiful turkey girls were rescued from a factory farm at only days old. They were just cute yellow fluffballs and had already endured having the ends of their beaks and their toes cut off. Despite their rocky start, they have grown into happy and healthy young ladies, and enjoy spending their time poking around the pastures, lying in the sun, or hanging out with their human and animal friends. In fact, you can hardly walk anywhere around the barn without them right behind you! 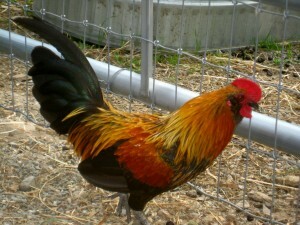 This colorful little bantam rooster was left at a local park by a petting zoo, who decided that it would be easier to replace him than to try and catch him. Luckily, we were able to come to his rescue before a hungry animal found him. Although shy at first, Burdock has become more comfortable around his human companions and enjoys spending his time hanging out with his new friend Kate. Malnourished, arthritic, and weighted down with at least 4 years growth of wool, Claria responded quickly to good food, medication, and shearing off her heavy coat. Although shy, Claria will trot quickly over for an apple slice or a few cranberries. We were thrilled to be able to give her a home with her good friend Maggie, free from worries forever.